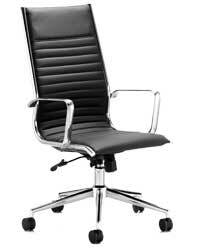 The Alpha leather office chair is the latest in innovative office chair design rated for 24 hour use. 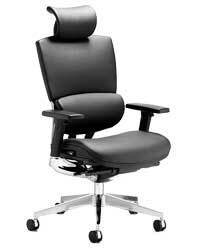 Incorporating a split backrest design with a weight resistant lumbar support, adjustable arms and multi-position arm pads the Alpha leather office chair is money well spent. Traditional in style, luxurious in feel. 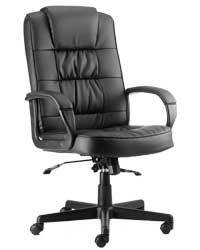 This popular range of executive chairs are upholstered in soft bonded leather with generous cushioning on seat and back. The deluxe version includes a Chrome base and Chrome arm detail. The Ritz designer office chair is a stylish, executive choice for any office or home office, with its full leather back and chrome finish. A new range of black, brown and cream bonded leather or brown suede chairs with light oak finish arms and base. 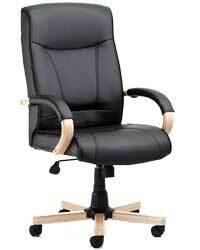 Luxurious and comfortable padded seat and back. Light oak finish wooden arms and base. Recline can be locked in any position or left in free float mode. Comfortable padded seat & back. Available in bonded Brown Suede. 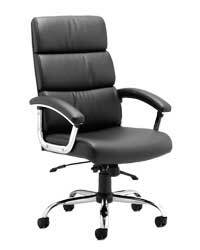 The Desire High Back Chair is modern and stylish leather cushioned chair with chrome arm rests.